Dunnellon, Florida — Two men have been arrested in Dunnellon after a traffic stop turns up a large amount of drugs. 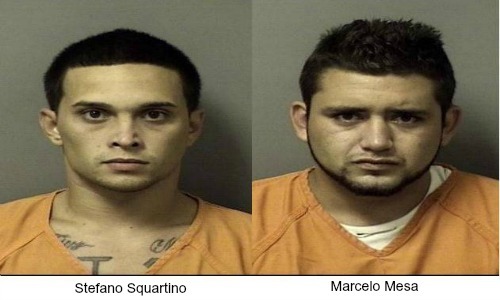 21-year-old Stefano Squartino and 20-year-old Marcelo Mesa, both of whom are from Marion County were arrested Tuesday, September 23, 2013, after being pulled over by a Dunnellon Police Officer for failing to use a turn signal. According to reports, when the officer approached the 2004 white Dodge driven by Squartino, he could smell a strong odor of marijuana coming from the inside the vehicle. After the officer asked if there were any narcotics in the car, Stefano advised him that there was marijuana in a backpack on the back seat. Inside the backpack were two Ziploc bags containing marijuana, according to police. Both men were then handcuffed and place in a patrol car. Upon being questioned separately, Squartino told the officer that his brother, Marcelo Mesa who was the passenger in the vehicle would go to prison if he was arrested; therefore he wanted all the charges to be placed on himself and asked that Mesa be released. The officer then spoke to Mesa and asked him if he was Squartino’s brother at which Mesa replied, “No, we have been friends since we were kids.” He told the officer that all the drugs in the car belonged to Squartino because he doesn’t do drugs anymore. Mesa then started to cry and said that he has a good job picking berries and is in the process of being hired by a club promotion company. Mesa told the officer that he would go to prison if he was arrested again because he is out on bond and pleaded for the officer to let him go and to not charge him with anything. A more thorough search of the car revealed a baggie inside the passenger door containing Psilocybin, more commonly referred to as mushrooms, which according to reports were approximately six inches from where Mesa had been sitting in the car. Also located in the backseat was a Kentucky Fried Chicken box. However instead of chicken, police found methamphetamines, more marijuana, Morphine, Xanax, and Hydrocodone pills. Squartino, who was handcuffed in the back of the officer’s patrol car asked to speak with him. Squartino said, “Did you say you found meth?” He then changed his story saying that all the items belonged to Mesa. He stated that he was not going to jail for Mesa because he didn’t know that he brought pills and meth in the car. He said that he knew about the marijuana but had no knowledge of the other drugs in the vehicle. Mesa was questioned about the drugs in which he told police that he had no idea there were any illegal narcotics in the vehicle, including the mushrooms in the door where he had been sitting. In all, police found 167.1 grams of marijuana, 10.2 grams of methamphetamines, 8 grams of mushrooms, 37 Morphine pills, 4 xanax pills, and 3 Hydrocodone pills. Marcelo Mesa was arrested and charged with three counts of Possession of a Controlled Substance, one count of Possession of a Controlled Substance with Intent to Sell, One count of Possession of a Schedule I, II, or III Narcotic with Intent to Sell, and one count of Trafficking in Four or More Grams of (Morphine, Opium, Oxycodone, or Heroin). He was booked into the Citrus County Jail on an $80,000 bond. Researched showed that Mesa has been arrested several times for various offenses. He was arrested in Pinellas County in 2011 for three counts of Burglary of an Unoccupied Conveyance, in June of 2013 for Possession of Marijuana Over 20 Grams and Possession of a Firearm During the Commission of a Felony in Marion County and again on September 4, 2013, for Burglary of an Unoccupied Dwelling, Grand Theft, and Petit Theft; which he was still out on bond for. Stefano Squartino was arrested and charged with Possession of a Controlled Substance and one count of Knowingly Driving While License Suspended. He has five previous arrests In Marion County for crimes ranging from Loitering, Petit Theft and Possession of Marijuana Over 20 Grams.